There are two types of setup time. One is the time of setup task before the production task, the other one is the time of teardown task after the production task. The setup time is determined by the following settings. 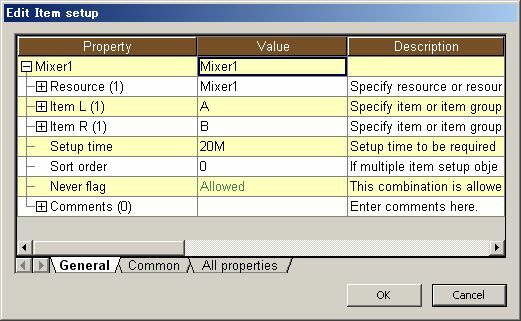 A1 Static setup “Setup” property of integrated master table Defines the setup time to start the manufacturing task for that operation. A2 “Setup” property of resource table Defines the setup time to start the manufacturing task for that operation. (changeover) Item setup table Defines the setup time according to the combination of main products of the left operation and the right operation. This is the item switching setup. B2 Resource setup table Defines the setup time according to the combination of the resources of the left operation and the right operation. This is the setup time required for jig switching, the change of workers, and so on. B3 Spec n setup table (n=1, 2, 3, 4) Defines the setup time according to the combination of the specifications of the left operation and the right operation. C1 Overwrite User specified setup time Overwrites the previous setup time calculated from A1, A2, B1, B2, B3. C2 EIIFilterCalcDuration of COM IF Overwrites the previous setup time calculated from A1, A2, C1. C3 EIIFilterCalcCombinationSetupDuration of COM IF Overwrites the setup time calculated from B1, B2, B3. B1, B2, B3 are tables that define the setup time for each combination of adjacent operations in a resource time series. Such setup time is called dynamical setup time or changeover time. On the other hand, A1 and A2 define setup times that do not depend on adjacent work, so this is called static setup time. C1, C2, C3 overwrite the setup time defined in A1, A2, B1, B2, B3. The teardown time is determined by the following settings. X1 Static setup “Teardown” property of integrated master table Defines the setup time after the manufacturing task for that operation has been completed. X2 “Teardown” property of resource table Defines the setup time after the manufacturing task for that operation has been completed. Y1 Overwrite User specified teardown time Overwrites the teardown time calculated from X1, X2. Y2 EIIFilterCalcDuration of COM IF Overwrites the teardown time calculated from X1, X2, Y1. You can choose whether to set up the setup time as the sum of the setup times defined by A1, A2, B1, B2, B3, or as the maximum value. This is specified in “Setup time calculation method” in the project settings. A1 or A2 means searching the settings in the order A1, A2, and applying the first one found. 1 and 2 are new functions of Ver. 9.0.4.0, and a restricted feature of Ver. 10. For example, suppose that the settings are as follows. Let’s suppose that operations OP1 and OP2 assign resources to R, S1 and S2 as follows. In this case, the setup time according to the method of calculating the setup time of operation OP2 is as follows. For example, if the preparation time that always occurs when using that resource is set to “Setup” of the Integrated Master Editor table, the process tooling switch time is set to the Resource Setup table, and the time put into equipment when work in progress is switched is set to the Item Setup table, and these three setup operations can be performed in parallel, set “MAX value”, and if cannot be performed in parallel, set “Total value”. Regarding (only one dynamical setup), see the explanation of resource setup below. Setup time is calculated by looking up the record in the item setup table corresponding to the resource to which the operations are assigned and the item codes of output instructions of the lefthand and righthand operations. For example, suppose that the item setup table is specified as follows. *RG1 here presents a resource group, and IG1 represents an item group. The first record means that "for any resource, from any item to any item, the setup time is 5 minutes." "*" means "any". The second record means that "the setup time on resource R1 is 0 between identical items". "=" means "the same as the other item"; if both items are marked "=", it means "when the previous and following items are the same". The third record means that "for any resource in resource group RG1, from any item in item group IG1 to item I3 or I4, the setup time is 7 minutes." As in the third, fourth, and fifth records, you can specify groups and multiple values in the Resource, Item L, and Item R fields. When "!" is specified in the Item L field as in the sixth record, it means that there is no operation on the left side. For example, the leftmost operations on the resource Gantt chart. Note that if we are looking up the setup time for operations on resource R1 from I1 to I2, the answer is not uniquely defined, since our conditions are matched by both record 1 and record 4. For this reason, we specify a sort order, so that the records will be searched beginning with the highest sort order, using the first record that matches. In general, you should give small sort orders to records containing general information, for example when specifying default settings.Higher sort orders should be assigned to records containing more specific information, as when specifying settings relating to particular items. In addition, the "!=" mark is available from Ver.9.0.4.0 (Ver.10 restricted feature). It means the item of left operation is different with the item of right operation. The setup time setting of R3 is the same with the onf of R4 as follows. The marks ( *, =, !=, !) as follows can be used in the "Item L" and "Item R" columns. The combinations except the four combinations as follows are ignored. * *, item group, item, ! In addition, in the case that the "Setup time factor" property of resource is specified, the resource changeover setup time will be effected. The setting method is aslo available for other changeover setup time table. Setup time is calculated by looking up the record in the spec n setup table corresponding to the resource to which the operations are assigned and the spec n of output instructions of the lefthand and righthand operations. Otherwise the method is the same as for the item setup table. You can define setup time for main resource and sub resource.It is used to define the setup time when the main resource of left operation is different with the main resource of right operation. the setup time (10 minutes) occurs when the sub resource switches from X1 to X2 when moving from operation OP1 to OP2, as follows. Normally, one object from each changeover table is selected, but if one specifies an instruction code and specifies a setup time, one can select multiple resource setup objects. In the following example, a resource setup is defined for instruction code S1 and instruction code S2. For example, if S1 is a mold and S2 is an operator instruction, and you want to total the time required for switching between the mold and the operator, this is defined as follows. If operations OP1 and OP2 are assigned as shown in the figure below, the setup time occurs as follows. At this time, the setup time by instruction code S1 (mold switching) and S2 (operator change) is as follows. This may be easier to understand if you think that a resource setup table is newly created for each instruction code in the resource setup table. In other words, this is as follows. Here is another example, where an instruction code should be used. For example, suppose that the following settings are made, without specifying an instruction code. The intent is to have a setup time occur when resource switching occurs. However, with these settings, when operations OP1 and OP2 are assigned as follows, looking at each instruction code, resources are not switched, but when looked at from the viewpoint of resource R, switching from X1 to Y1 and from Y1 to X1 is considered to have occurred, and a setup time will occur. If you specify an instruction code as follows, no setup time will occur. Further, even if you specify multiple instruction codes with semicolon separators in "Instruction code" as follows, or specify “*”, no setup time will occur. Sample data is available. For further details please see the Sample A-2 project file. * This property is for maintaining compatibility with the specifications of past versions. Basically, set "Sort order" or specify the "Instruction code" property to define the setup time for each instruction code. In the above example, next let’s consider the case of not having specified an instruction code this time. At this time, only one resource setup object must be selected from the resource setup table. "Resource setup time selection method" property is only can be used from Ver.8.0.2. In case of before Ver.8.0.2, "Order of appearance" is selected. * The Enum of this property is for maintaining compatibility with the specifications of past versions. If you have a license of Ver. 10 or higher, set it either to "Maximum value" or "Total value", or specify the setup time for each instruction code by specifying the "Instruction code" property. This is set as either checking resource switching between adjacent operations with all use instructions, or checking from the main resource in order, and if not found, ending. For example, suppose that the resource setup table is specified as follows. Furthermore, it is assumed that the setup time was defined with instruction codes S1 and S2 in the Integrated Master. In this case, if operations OP1 and OP2 are assigned, a setup time will be generated in OP2. Although the above two resource setup objects correspond to the setup time, one resource setup object must be selected from the resource setup table because no instruction code is specified. If set as follows, if even one resource switching occurs, setup time will be generated. In a similar setting, if the sorting order is specified as follows, even if you set the “Setup time calculation method” in the project settings to “Maximum value” or “Total value” and calculate the setup time for all use instructions, if the same resources are consecutive in one use instruction, the resource setup object of the setup time of the first row = 0 seconds is selected, and no setup time occurs. Therefore, in such a case, set !=. An external setup time is assigned to a different resource from the resource to which the use instruction of the production task is assigned. An external setup time is assigned to a different resource from the resource to which the use instruction of the production task is assigned. In the example above, the external setup time for Equipment1 is 60 minutes and it is assigned to the External setup equipment. Operations contain link information to applicable changeover objects, which you may confirm in the link tab of the properties window. As item setup applies to the following operation, the information is specified in "Changeover object (item setup)." You may jump to the changeover object by clicking the black arrow in "Changeover object (item setup)." * The actual setup time is dependent on the setup time calculation method in addition to the linked changeover object.